The “Opportunity School District” (“OSD”) is a proposed, statewide takeover district that would allow the state to seize control of up to 100 “failing” schools for between five and 10 years. This is but the latest effort to remake public education in the state of Georgia. In each instance, these dramatic measures take control over educational priorities away from students, parents, residents, and educators, and confer it to wealthy developers, out-of-state charter school boosters, and an overwhelmingly white state administration. The “Opportunity School District” (“OSD”) is a proposed, statewide takeover district that would allow the state to seize control of up to 100 “failing” schools for between ve and 10 years. This is but the latest effort to remake public education in the state of Georgia. In each instance, these dramatic measures take control over educational priorities away from students, parents, residents, and educators, and confer it to wealthy developers, out-of-state charter school boosters, and an overwhelmingly white state administration. 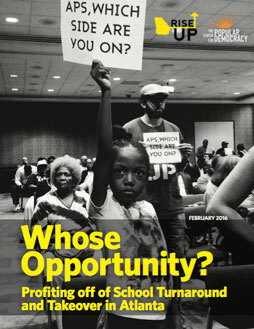 This report concludes that a true turnaround plan centers communities in school decision-making and structure, rather than stripping control of educational institutions from low-income communities of color. in school takeover initiatives. The report then focuses on Atlanta—Atlanta Public Schools (“APS”) has the largest number of schools – 26 – eligible for takeover of any district.1 Here, Black students and communities are already at risk under the current proposal, even as the actors that have invested the most in passing the OSD initiative and expanding charter schools in Georgia—including education consultants, real estate developers, and education management organizations—are all well poised to gain nancially in the takeover plan. The report nds that many of the people and entities involved in the push for and the business of taking the public schools out of public hands have clear con icts of interest. The report concludes by offering speci c recommendations toward an alternative approach to improving school performance. Restore funding levels to education back to 2002 levels, adjusted for in ation. Embark on a real community input process, enlisting community-based organizations to design and implement a study, starting with the Atlanta Public School system. ■ Curriculum that is engaging, culturally relevant and challenging. ■ High quality teaching, not on high stakes testing. ■ Wrap-around supports such as health care, eye care and social and emotional services that support academics. ■ Positive discipline practices such as restorative justice and social and emotional learning supports. ■ Transformational parent and community engagement. The full community should actively participates in planning and decision-making.